Thousands of women are interested in mountain biking. Some have been biking rough trails since they were old enough to ride, while others are just discovering the sport. Regardless of your level of expertise, you deserve to have an effective mountain bike at an affordable price. We’ve put together this list with that in mind. When you’re picking out your bike, there are a few things to keep in mind. “Women’s” bikes are actually a fairly recent invention. In the past, mountain bikes were considered unisex. Men and women both rode them. Women-specific bikes have both benefits and drawbacks. The biggest benefit is that these bikes make mountain biking accessible to women who can’t fit on traditionally-sized bikes. But they have also separated the sport of mountain biking into men versus women. In addition, not all women’s bikes will suit every woman’s body. Women’s bodies are just as varied and diverse as men’s. A woman’s bike tends to be a good starting place if you’re a beginner. They tend to fit a wider range of women than a traditional mountain bike. Women’s bikes are designed with woman-specific seats, narrower handle bars, and lower heights. If you’re paying less than $1,000, you’re probably going to find a bike that only has front suspension. A bike with full suspension capabilities will be much more expensive. If you do find a sub-1,000 bike with full suspension, be very careful; it may be constructed with inferior materials. Many entry-level bikes have similar suspension forks. The most common one on a sub-1,000 bike is the SR Suntour fork. The biggest difference in suspension is whether a bike has a remote lock-out fork or not. Remote lock-out capabilities let you stiffen the fork on steep trails without needing to remove your hands from the handles. There are a number of different wheel sizes for mountain bikes. You’ll most typically see 26-inch, 27.5-inch, and 29-inch options. The best size for you will vary based on your personal preferences. Larger wheels tackle obstacles more easily, but they’re slightly more difficult to maneuver around corners. Tires also have various sizes. It’s important to get tires that match the wheel size. But you’ll find width variation. 2.0-width tires tend to be very narrow, while 2.8-width tires are thick. Wider tires are better for rough terrain. Narrow tires roll faster over smooth and gravel paths. Some tires and wheels are tubeless-ready or tubeless. What this means is that you can ride the bike without traditional tubing. You won’t find many tubeless-ready bikes at this price range, but there are a few. Tubeless tires greatly decrease your chances of getting a flat tire. Your drivetrain is the mechanism that pushes your bike forward and lets you shift gears. You’ll find a number of different drivetrains with different gear specifications. One of the most common companies is Shimano. You’ll typically be choosing between hydraulic disc brakes or mechanical disc brakes. Mechanical brakes are easiest to maintain and cheaper. However, hydraulics give superior performance, especially if you’re riding at steep elevations and high speeds. This bike is shaped, designed, and manufactured with geometry specific to women. The frame is stiff and durable, allowing for both trail and cross-country riding. The bike includes a 3×9 speed drivetrain that lets you use multiple gears to tackle all kinds of terrain. The bike is constructed with 27.5-inch wheels, which combine agility and speed to make your rides as adventurous as possible. To help you get the best possible fit for the frame, the bike includes a slightly narrow handlebar, a seat designed for women, and short reach brake levers. If you’re a beginner on the mountain biking scene, the Zaskar is a great place to start. The handling will boost your confidence no matter the terrain. The updated frame provides more durability and aerodynamics than many other competitors. The Wildcat Trail 1 is an ideal mountain bike for women. The handlebars, grips, and saddle are all specifically designed to accommodate women. This bike is recommended for entry-level cyclists who are looking for recreational fun. It’s also recommended for women who have just started exploring mountain biking. The design comes with plush and nimble 27.5-inch tires. The bike also has a 7-speed Shimano Tourney gear set, so you can tackle both flat trails and steep, winding roads. Another selling point is the aluminum frame, which is lightweight while also being durable. You don’t have to worry about a heavy bike making it too hard to get up a steep trail; this bike is built to be aggressive. This bike provides one of the best fits for women. Every aspect of the design is made with women in mind. The grips and handlebars are meant to fit a woman’s typical frame, and the saddle is comfortable for women. The frame is also built to accommodate a typical woman’s body. You get a better fit with this bike, which makes you more comfortable on long bike rides. It’s also easier to mount the bike. The design has larger wheels than many of the competitors, coming in at a whopping 29 inches. The hydraulic disc brakes help you slow down even at high speeds. And you can certainly reach high speeds thanks to the 10 gear speeds. This bike is made for heavy-duty mountain bikers. The bike is also an ideal choice if you’re a woman who wants a comfortable and stable ride that’s suited to everyday use. Even though the bike is marketed toward commuters and beginner trail riders, it’s heavy-duty enough to handle difficult mountain trails. This bike is designed with SRAM twist shifters, which are ideal if you’re riding on rough trails or bumpy roads. For this reason, it’s one of the best options if you plan to ride on tough terrain. You can use the shifters to change gears smoothly and quickly to adjust to unexpected trail conditions. The bike is equipped with a stunning 21-speed rear derailleur, so you can achieve basically any speed you’ve set your mind to. The frame is made from solid steel, and the suspension fork can absorb the shock of rough roads. You’ll have a durable ride and a maximum level of control. Schwinn is an industry leader in bike manufacturing. The company’s bikes are considered by experts to be well-constructed, comfortable, and highly durable. If you plan to go on multi-mile bike rides over rough terrain, the High Timber is a good choice from an industry leader. This is another mountain bike specifically designed for women riders. It has a sporty construction that’s ideal for trail riding and mountain biking. The aluminum frame is durable and lightweight. A low stand-over height allows for easy mounting and dismounting. The original bike in this series was called the Lux. This bike, the Lux Sport, is an upgrade that features 27.5-inch wheels. The final piece of the build is the hydraulic system for the disc brakes. You have immense braking power even on fast downhill descents. A 9-speed drivetrain helps you get to flying speeds on flat trails. Overall, this is a bike that can suit any number of mountain bikers. Whether you need to upgrade an old bike to a better model, or this is your first time buying a mountain bike, the Lux Sport has all the ideal features you’d find. It lets you ride with confidence while integrating new biking technology. Liv Cycling is one of the most effective companies when it comes to manufacturing bicycles for women. On top of that, the company tends to design some of the best bikes you’ll find for less than $1,000, regardless of gender. The Liv Tempt 2 is a great option because it comes with tubeless wheels and ready tires. It’s ready to go as soon as you get it. In addition, the bike has mechanical disc brakes that help give you ideal braking power. The SunTour air fork lets you travel longer distances than ever before. This offering from Cannondale is living proof that nice bikes are available without spending thousands of dollars. Like many ideal mountain bikes, this model uses a suspension air fork to help with short travel. The bike comes with hydraulic disc brakes that give you superior stopping capability on any kind of trail. There’s also internal cable routing and a Shimano drivetrain to help maximize your speed and efficiency. This is a great biking option if you’re just getting started. This model from Co-Op Cycles will probably appeal to REI members. Co-Op Cycles is the bike brand associated with REI. The company makes decent quality bikes at a low cost. This particular bike is great for women who love mountain biking. The saddle is specifically designed to conform to a woman’s body. It’s comfortable from the get-go, so you don’t need to drop money on a separate saddle. You also get a frame that’s compatible with dropper-post designs, so you can easily upgrade when you’re ready. You get access to hydraulic disc brakes that offer superior performance. In addition, the suspension fork has a remote-lock capability, and this model also comes with internal cable routing for efficiency. Specialized is among the largest bike manufacturers worldwide. The company has enough resources to manufacture high-quality bikes that cost a fraction of what you’d find with a smaller brand. The Rockhopper is a classic mountain bike that has introduced many women to the sport over the past decade or so. But this design improves upon the original Rockhopper. The Rockhopper Expert comes with 29-inch wheels and a superior drivetrain. It also has an air fork to help your suspension. Like many other options on the list, this bike boasts hydraulic disc brakes, which are more effective than many other braking systems. 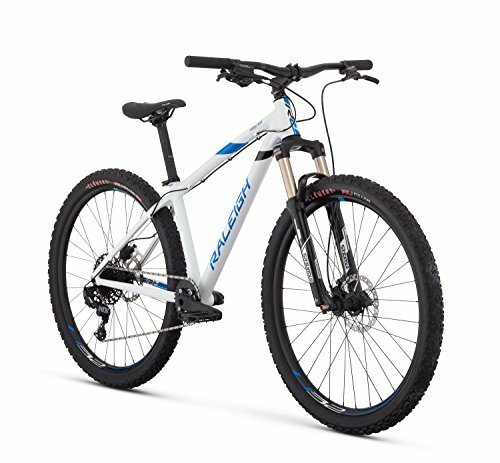 If you’re new to mountain biking, both the Zaskar and Wildcat bikes may be a good fit for you. They have designs suited to your body type, so riding is always easy. The Zaskar is built to be durable, while the Wildcat is built to be lightweight and comfortable. The Fuji Nevada bike is a step up in terms of difficulty. It has larger wheels, hydraulic brakes, and 10 speeds. This is a good choice for intermediate mountain bikers who want to tackle tough trails. But it’s comfortable and simple enough to suit entry-level enthusiasts and commuters as well. The Schwinn bike is good if you want even more heavy-duty riding. If you’re going to be traversing several miles of rough trail, you’ll want the bike’s twist shifters. It’s important to be able to switch gears when the trail changes unexpectedly.